The great thing about tube amplifiers is that they produce a rich, organic tone, irrespective of how far they’re cranked up; a feat that even the most modern solid-state amps find hard to replicate. The downside is that most tube amps are far too bulky and powerful for practical home use – until recently that is. 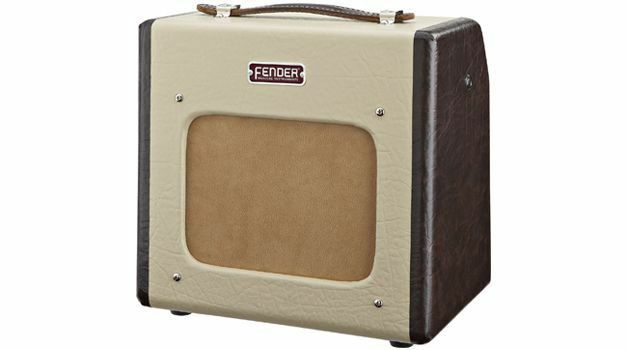 Following in the footsteps of manufacturers such as Carr, Emery and Bümbox who each introduced their own takes on the low-power, home-friendly tube amp, Fender introduced the Fender Champion 600 Electric Guitar Amplifier. Although commonly referred to as a “reissue” of the late ‘40s Champ 600s, this tiny beast is more of a “tribute” with a few key differences. For instance while the original Champs featured a 6SJ7 preamp tube, the current versions are powered by a 12AX7 preamp section which allows for much more gain than the Champ 600s of old. Fender has also managed to keep the price of the amp to a mere $200 thanks to Chinese manufacturing. To be honest I’m a huge fan of vintage design amplifiers and I fell in love with the Fender Champ 600 the moment I saw it. But don’t let the amps 1950-esque two- tone cosmetics, adorable as they are, fool you. The Champ is quite sturdily built and isn’t likely to fall apart on you anytime soon. The two-tone tolex used for the amp’s outer covering is much tougher than regular tolex and the front faceplate is metal. So this amp can really take a beating. The only noticeable weak point is the faux-suede grill cloth which feels like it could rip apart if not treated carefully. The amp’s interface is simple and includes just two inputs (low and high gain), a volume control knob that goes from 1-12, an on-off toggle switch and a vintage red indicator light. Considering the Champ 600’s $200 price tag and tiny size, the sound that this amp produces is truly excellent. The clean tones are crisp and detailed and carry a level of depth that’s incredibly rare for amps in this price range. The amp also breaks up beautifully from around the 8-9 mark and the distortion is nice and organic. The level of breakup also depends on the pickups on the guitar being used, but the Champ 600 rarely goes beyond a 1960s-esque classic rock rumble. And if you’re looking for a higher gain sound you can always hook up a basic overdrive pedal to it. The really great thing about this amp is that it gives off that tube warmth even at low volumes, which makes it an excellent practice/jamming amp. And once you crank up the volume to 12 you can also let the weight of your strumming hand dictate the amount of distortion you get without having to change any settings. Apart from its adorable looks, handy size and rugged build, the Champ 600’s biggest strength is in its ability to produce both a full-bodied clean tone and a nice crunchy overdrive at home-friendly volume levels. And to be honest you’d be hard pressed to find another amp that offers as much value at $200.